Choose from the wide range of Crown Wall Canopy & Wall Clocks by Exclusive Furniture World. Vintage Copper Effect 92cm Wall Clock Dimensions:Size: 92 x 92 cmMaterial:MetalEAN:7434914950992Pack..
Vintage Cream Distressed 110cm Twist Frame Wall Clock Dimensions:H110 x W110 cmMaterial:Metal - Batt..
Vintage Silver 92cm Wall Clock Dimensions:Size: 92 x 92 cmMaterial:MetalEAN:7434914950985Packing Spe..
Vintage Speckled Grey 110cm Wall ClockDimensions:H110 x W110 cmMaterial:MetalEAN:7434914950978Packin..
A stylish table clock in a vintage copper effect design. The face reads “CHAMPS ELYSEES FRANCE” with..
A Black Wooden Mantel Clock with Roman numerals. This stylish clock is finished in black with distre.. Wooden distressed effect clock with metal pendulum for display. 58Cm 1 x AA battery required. P.. 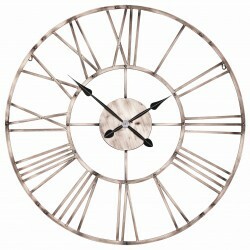 The clock has a glass face cover protecting the stylish wooden Roman numeral design. The words "Old ..
A square skeleton style waxed wooden clock with black hands. 30cm x 30cm x 6cm. A stylish item to en..
A shabby chic clock with a vintage look. This clock has large easy to read letters and a hole at the.. This clock boasts a unique design, the numbers are slightly embossed giving them a 3D look. The cloc..
A box clock with carved out heart to display a clock face. 26Cm x 26cm. A lime washed wood creates a.. This is a super large retro style wall clock. It will feature prominently in any room of the house a.. The clock face is slightly embossed so it stands out in relief compared to the surface the Roman num.. This light weight wall clock boast a contemporary and vintage influence in its design, giving it a u..